Keep warm and think of California! I shall do that……..California sounds delish…..I used to think of Florida but my friends down there say it’s in the 30s which is NOT NICE! I hope the cold goes away soon for you, Sammy! Summer I hope it does too – I’m QUITE tired of it!! 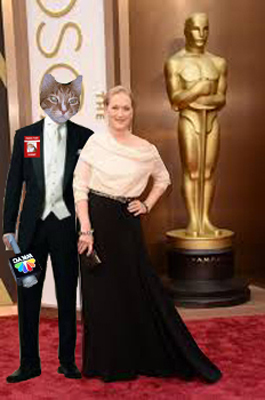 I shall report on my interviewing activities at the Oscars……!! How’s things Down Under? Get more rain? Is your pond full yet? I worry about the wildlife!! Whee don’t blame you, whee aren’t fans of the cold either!! Hopefully it starts to warm up soon! Our temperature is 3 right now. I hope it goes higher before Mom takes me walking around outside. Either way, I’ll be wearing a sweater under my coat and shivering. And Mom will say the word, “Hurry up.” a hundred times. Well I’m sure you will do your best to “hurry up” since no doubt your paws will be COLD COLD COLD and you will want to be back inside ASAP too! We started at 3 this morning but now we’re having at heat wave at 7 degrees! It´s cold over here too today and it´s snowing !! I sure hope it will go away ASAP !! Hi Charlie!!!! Nice to hear from you…..how much snow are you going to get? I bet you’re VERY HAPPY you have such a nice warm house to live in…..I bet your Mom wishes she could stay home with you!! Thanks Speedy……..!!! Stay cozy yourself – nothing worse than cold buns! Brrrrrr!!! I’m getting a little tired of my “snow view”, Sammy! We had a warm up this morning… 14 instead of -2! Now we have freezing drizzle on the way. I am just nesting and reading and eating CH’s chocolate chip PB cookies.. 🙂 Stay warm Sammy! It’s freezing cold here too, Sammy. Thank cod we’re inside. I’d settle for a sand box with a heat lamp. Wish I could…….can’t wait to hear about meeting Shoko’s Mom and Dad!!!!!! Brrrrrrrrr. It’s 37 here in Florida. That is great that you get to be an interviewer at the awards. Nic Cage isn’t up for an award, but if you see him, please tell him I have been his number one fan for 30 years. Keep warm. My Mom really likes him too……………I’ll keep an eye open for him! 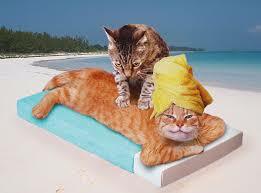 I’m with ya sammy… is there a second massage table on that beach? You met Meryl in the furs? can you ask her if my momma can get the black coat she wore as she was the devil in prada? Hi Easy! I will definitely ask Meryl about the coat……seems to me we could find a knock-off that might be in your Mom’s price range of that DEVILISH coat somewhere, BUTTTTTT your Mom can’t drive anyway so sounds like she should visit the internet store…!! HAHAHAHAHAHAHA………”The She Devil of Brittany” !! It almost makes me feel guilty to say we’ve had highs in the 60s and lows in the 40s for the past couple of weeks. Stay warm my friend. You’re almost out of the woods. Pitchers and catchers reported for spring training yesterday. Madi it’s THIRTY DEGREES at Raz’s place today – – – now that’s what I call “Floridian Chill” !!! I’m kind of thinking I’ll stay HERE and on Mom’s lap or on top of a heat register and just SLEEP until Spring……!! This cold is just miserable! And it’s only be in the 20s and 30s here! I don’t even want to know what 12 degrees feels like!!! YIKES! Stay warm! I am staying INSIDE – preferably on a fleece blankie or even better, Mom’s lap! It’s outrageous out there……….today’s HIGH is 16! Sammy, mes is thinking about yous as mes luxuriating in the warmth of the sun on the back deck. COLD IS AWFUL! Yous can comes and visits mes if yous like. A sunny deck sounds delicious……….ANY sun sounds delicious………we have overcast skies and snow expected here this morning but at least it’s 16 degrees – that’s a heatwave! I don’t like that cold stuff either Sammy, let’s do the Bring on Spring dance! YIKES…….well we had some single digits around here yesterday and this morning it’s only 16 with snow expected in a little while but I think ALL of us would enjoy even some 40s!!!!! It’s time for some WARM…….C’mon Spring! YEP – frozen from tip to tail! Uhoh…..I hope that fog monster doesn’t grab you!!!!! Be CAREFUL! Last night was the coldest in 10 years brrrr and our old house is drafty! The red carpet sounds like a fun, warm place to be. Miss Layla, I would guess that a beautiful old farmhouse would have a few drafts around….but you all will stay cozy and snug I’m sure!! I know what you mean about the cold, Sammy, it was 9 in VA Beach this morning! Hurry Spring!!!!!!!!!!!!!!!!!!!!!!!!!!!!!!!!!!! Stay warm and you and your pawrents have a good weekend. You are very brave to go out for any length of time in such cold! BRRRR. Well I rarely do that these days except for little minutes here and there on the covered front porch….but stepping through the snow? OH NO! Ya know what warms ya up? BACON! It sure does………….warms you up from the inside OUT! we hope it goes away real soon and the sunspots come out to play! That would be GRAND…..I keep looking up to the sky for some sun but all I get is CLOUDS and SNOW! I would rather be on the beach too Sammy. Mum has ordered me some natural medicine after discussing it with my vet to see if it will help with my thyroid, and guess what, it’s bacon flavoured. It won’t get here for about 3 weeks but I will let you know how I get on with it. Oh boy! Flynn that sounds wonderful! What’s the name of it? It would be grand to take something natural that you might not have any problems with that’s bacon-flavored!!!!!!! WOW……good luck my dear friend. It’s called Thyroid support Gold and it is liquid andcan be dropped onto food. It says “Administer product orally twice daily. Give one drop for every 2 lb (1kg) of body weight. We must admit that we do love the cold weather and the snow, but we will cross our paws that your part of the country gets a lot warmer quickly. I know you all love that snow……and believe me, in my younger days I was out there forging a path through it myself but those days are gone and I’m in love with my fleece blanket and the fireplace!!!! Yeowzers Sammy!! We know you and the Mom and Dad are in part of the cold, cold…we have close relatives in Philly and Binghamton, NY and they are ready for SUMMER! I think your relatives got it a LOT worse than we did but yes – it’s just been cold for TOOOOOOOOOOOOOO long. We really can’t wait for a THAW! Well, it’s funny because my Mom LOVES cold weather because she can wear pretty sweaters and cozy socks and bundle up nice and snuggy in a blanket in front of a fire BUTTTTT she also likes working in her garden in the shade and enjoying a big glass of lemonade and feeling the sun on her skin……………SOMEWHERE is a happy medium – maybe that’s Spring?????? Deer Unccle Sammy it iss even colder here!! Shee said it could make mee sick…. Siddhartha I promise that when the weather finally DOES get nice, you will LOVE being outside in your condo…….Angel Nylablue enjoyed napping in the sun in the condo and I know you will too. I’m also glad to hear that you like your new vet lady. I bet she fell in love with you the minute she saw you! 😉 Doc becker wanted to cuddle mee rite off!! Mee did mee wriggley fing an shee let mee roam round thee room. Mew mew mew..
Mee an LadyMum have meowed bout thee Condo goin outside. Mee will try it fur sure. 12!!! That sounds balmy compared to -41 c here, lol. I’m dreaming of summer, just like you. YIKES……yes it IS balmy compared to minus 41. 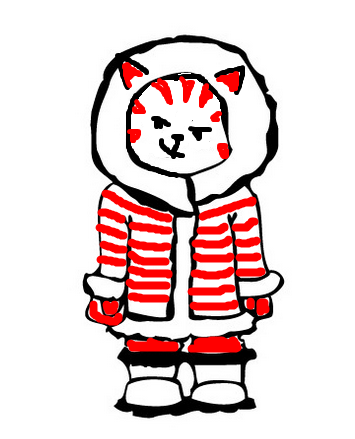 Are you at the North Pole????? Prairies, Canada. That’s with the windchill and the last few days we’ve been having extreme windchill warnings. Gotta love winter, lol. Can’t wait for summer. All we can do is hope for Spring Sammy! 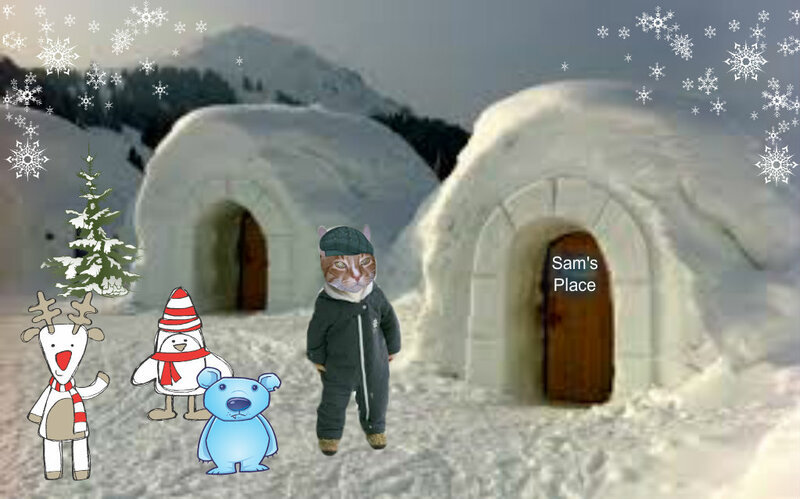 Oh Sammy so sorry yous haviin” all dat snow. Weez not like it here eevew. And evewytime we see it in da furcast we stawt purrayin’ weally hawd fur it too go away. Stay warm and weez’ll be seein’ ya’.